The bathroom mirror is one of the most important components of the bathroom, and perhaps even one of the most important components of the home. Countless hours are often spent in front of the mirror, and it’s important to choose the right one for your particular bathroom and application. 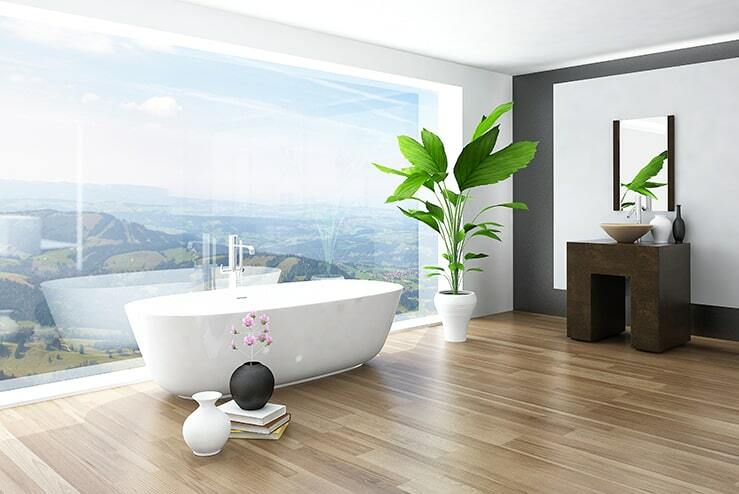 In addition to being a completely utilitarian piece, the bathroom mirror has now also found a place as a true element of home design and can also add to the amount of natural light and feeling of a space, if chosen and installed correctly. Choosing a mirror requires careful consideration of some key factors. Bathroom mirrors can be framed, unframed, or custom made. Framed mirrors add another dimension stylistically, but they’re also bulkier than their unframed counterparts. Furthermore, unframed mirrors are currently in vogue due to their floating effect and minimalistic integration. It’s also possible to purchase frames and mirrors separately and form a custom design, however installation can then become slightly more complicated. Framed mirrors can also result in a reduction in the surface area when compared to unframed mirrors, so make sure you have enough space to fit in both a mirror and a frame. As a general rule of thumb, it’s important to consider the size of your vanity before determining how large your bathroom mirror should be. More specifically, the mirror should generally be no wider (and in fact, slightly narrower) than your vanity. It should also generally be no taller than your vanity. This keeps it well proportioned within your overall space. It can often be difficult to obtain a real feel for the size of a potential mirror without seeing it in your own bathroom. In order to combat this, particularly if you’re installing a mirror into a new space, using some blank pieces of paper cut or stuck to size and then taped to your wall is a great way to visualise the real proportions of various mirror sizes before committing to a final decision. That said, some modern designers ignore these rules of thumb and create focal points by using larger mirrors for added effect and function. Bathroom mirrors come in a large variety of styles, colours, and shapes. Using a different shape can create a focal point in your bathroom, and implementing the paper test for this scenario is also a valuable way to determine how certain shapes will look. In terms of styles and colours, simple is usually best, and opting for colours that are subtle and match your decor is usually a safe bet for those looking for more character than a plain mirror. Subtle finishes such as chrome or brushed aluminium are also a popular choice nowadays as a potentially good compromise between full frames and unframed mirrors. Mirrors are more than just a way to quickly glance at your appearance before leaving the house. They now serve multiple purposes or functions such as interior space perception (reflecting light and making a room appear larger), and even storage (maximising storage space with integrated or hidden shelving). Furthermore, some mirrors have integrated lighting for better viewing, and even ambience settings as an alternative to traditional bathroom lights. Consider what else you may need or want your mirror to do in addition to its use as a reflector. Fundamentally, of course, a good mirror should still allow you to see yourself with accuracy. When selecting the most appropriate mirror for your bathroom, an important consideration is how it needs to be mounted. Some styles of mirror are best suited to glue, while others are best suited to hanging hooks or bracket installations. Generally speaking, glue is the safest and most permanent setting, and is favoured for flat and unframed mirrors. Consider your preferred style of mirror, the likely permanence of it, and the strength of the mounting application that is required. Safety is paramount, so ensure a solid mounting option is used. For mirrors with integrated lighting, a licensed electrician should be hired to ensure it is properly positioned and connected. Furthermore, when mounting mirrors, consider their position in relation to any windows, as the bathroom mirror provides an excellent opportunity to reflect natural light and create a much larger feeling bathroom. When choosing a new mirror or your bathroom, take your time in determining what you like and how it would work with the rest of your bathroom and home decor. Taking inspiration from magazines, and relating the concepts back to your own space, will give you some insight into what will work and what may not. There’s plenty of choice, so there should be no issues in eventually finding the perfect bathroom mirror for your home, adding style, and providing a useful backdrop in your bathroom.